Enteral feeding, or tube feeding, is a way to deliver nutrients through a tube if you cannot take food or drink through your mouth. In some cases, you may only need tube feeding for a short period of time during your hospital stay. In other cases, you may need to go home with the tube in place and continue to receive nutrition this way. It may be temporary or permanent. Tube feeding provides you with proper nutrition when a condition makes it difficult, unsafe, or impossible to take food in through your mouth. Fluids and medications can also be given through the tube. 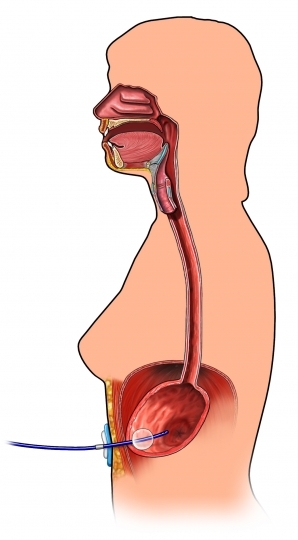 If you have gastroesophageal reflux disease , you may be at increased risk for vomiting or aspiration. Thoroughly wash their hands before handling the supplies and the tube. Set up the supplies. Depending on the feeding method, the supplies may include a syringe, measuring cup, feeding bag, electronic pump, and a pole to hang the bag. Use a formula that will provide you with the right amount of protein, fat, carbohydrates, vitamins, minerals, and fluid. Have you sit in an upright position. Check to make sure that the tube is in the right position before putting the formula in it—For example, if you have a gastrostomy tube (g-tube), this may be done by using a syringe to extract a small amount of gastric fluids. Also, a ruler may be used to measure the length of the tube. If no gastric fluids are seen or if the length of the tube has changed, this may mean that the tube has become dislodged. You will then need further treatment. Use a syringe to flush the tube with water to prepare you for the feeding. Tube feedings may be delivered by several methods. Depending on your condition, a nurse, trained caregiver, or family member may deliver the tube feeding. If you are able, you may receive training on how to give yourself the feedings. The feeding tube will be clamped or kinked. A large syringe will be attached to it. The formula will be poured slowly into the syringe. The tube will then be unclamped, and the syringe will be held high. This allows gravity to move the formula through the tube. When the feeding is done, the tube will be flushed with water to prevent clogging. The tube will then be clamped again, and the syringe will be removed. The tube will be recapped and taped to the body. If the syringe method is used, you will need several feedings throughout the day. These are called bolus feedings. First, the formula will be poured into the feeding bag. The bag will be hung on a pole. The tube from the bag will be connected to the clamped feeding tube. When the 2 tubes are connected, the feeding tube will be unclamped, allowing the formula to flow. As with the syringe method, gravity will move the formula through the tube. The flow can also be adjusted using a regulator clamp. When the feeding is done, a syringe filled with water will be used to flush the tube. Lastly, the tube will be capped and taped to your body. You will have several feedings during the day. These steps are similar to the gravity-drip method. The difference is that the tubes are connected to an electronic pump. The pump will be programmed to deliver the formula at a set rate per hour. For example, with continuous feeding, you will slowly be fed throughout the day. If you need this approach, the feeding will be stopped every 4 hours. The tube will be flushed with water so that it does not get clogged. The pump method can also be used for bolus feedings. Stay in an upright position during the feeding and for 30-60 minutes after the feeding. If advised by your doctor, do not exercise after the feeding. After thorough hand washing, the stoma site will be cleaned and gently dried. Feeding tube supplies will be cleaned with warm water and dish washing soap. The supplies will be thoroughly rinsed and air-dried. For pumps, follow the manufacturer's guidelines. Remember that you still need to take care of your mouth and teeth. Brush your teeth twice a day, or as advised by your doctor. Enteral feeding—an overview. Dietetics website. Available at: https://www.dietetics.co.uk/enteral-feeding.aspx. Accessed January 10, 2018. Gastrostomy feeding tube—bolus. University of Maryland Marlene and Steward Greenbaum Cancer Center website. Available at: http://www.umm.edu/health/medical/ency/carepoints/gastrostomy-feeding-tube-bolus. Accessed January 10, 2018. Gastrostomy feeding by syringe. Cincinnati Children’s website Available at: https://www.cincinnatichildrens.org/health/g/g-tube-syringe. Updated July 2015. Accessed January 10, 2018. Tube feeding at home. Queensland Health Government website. Available at: https://www.health.qld.gov.au/%5F%5Fdata/assets/pdf%5Ffile/0032/360896/etf%5Ftfah.pdf. Accessed January 10, 2018. Tube feeding systems. Oral Cancer Foundation website. Available at: https://oralcancerfoundation.org/nutrition/tube-feeding-systems. Accessed January 10, 2018.